Rugelah, rugelach, ruggelah… don’t come here looking for a definitive spelling. Hebrew words, like Hanukkah, have no one right spelling in English. But read on if you want a proper recipe. Any way you spell it, rugelach is a Jewish cookie made with a cream cheese pastry dough, and rolled with brown sugar, nuts, cinnamon, and anything else you like. These rugelach include chocolate chips. 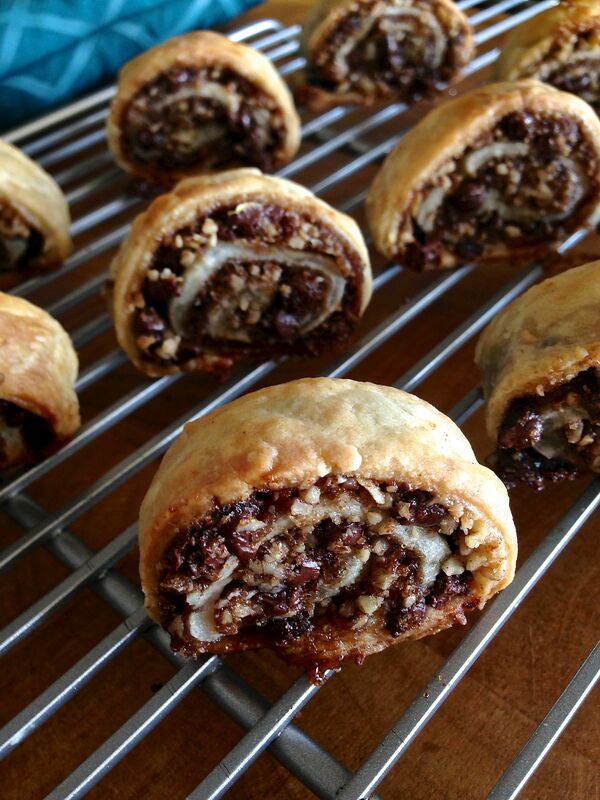 This rugelach recipe comes from my mom and has been perfected for over 20 years. For most of those years she has lead the baking for the Jewish Food Festival in Carmel, for which she and a team make 2000+ pieces in small batches each year. When a recipe has been made several hundred times, you know that it is tried and true. Here I am with my dad, circa age 15, in a mock wedding from the era of “Fiddler on the Roof” at the Jewish Food Festival. Random trivia: My cousin Rachel has had many nicknames over the years, but “Rugelach” is one of the earliest. This recipe freezes really well. My mom will pre-cut a roll, but leave one layer of the roll intact, so that it stays together as a log. Then you can pull it out, cut the rest of the way, and bake any time you have a craving. The cookies don’t even have to defrost before baking. This chocolate chip version is tasty, but I love the simple brown sugar, cinnamon and nuts original the best. Like my great-grandmother's matzo ball soup, this recipe was originally published in 1994 in a synagogue cookbook. 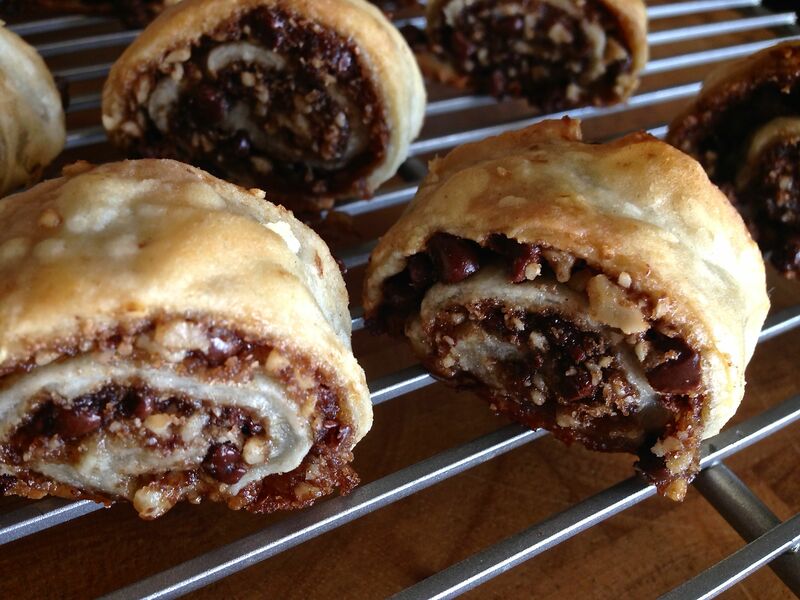 The rugelach recipe was submitted by Joyce Kurtz, with additional tips by Diana Rosenthal. Cream butter and cream cheese and gradually add flour. Roll into a ball and chill overnight. Divide ball into 2 pieces and roll each into an ⅛ inch thick rectangular shape. Mix the brown sugar, nuts and cinnamon and liberally spread the mix on the dough. Roll jelly roll fashion, starting with the longest side of the rectangle. Cut ¾ inch slices and bake on a silicone mat at 350* for 20 minutes, or until brown and bubbling. Nuts chopped fine with a food processor and mini chocolate chips are preferred as bigger chips or nuts will tear the dough when rolling up the logs.